Where the Wars Were: Journey to Vietnam, Laos & Cambodia: WHAT HAPPENED TO THE US EMBASSY IN SAIGON? Like everything else in the former city of Saigon, the expatriate scene here has changed completely over the years. When this was the national capital of a country at war, the expat community was large and diverse. There were many ambassadors, intelligence spooks, foreign soldiers, journalists and aid workers. But no longer. Now there’s no war, and this is no longer a national capital. But since the country returned to capitalism in the 1980’s, the city has become the business capital of Vietnam. Nowadays Ho Chi Minh City is all about earning money, and expats making things happen here are all businessmen. More numerous, but less influential, are foreign English teachers. All the ambassadors have gone to Hanoi, though some lower diplomats remain. With all this in mind, I'm heading for the most famous former embassy in American history. I approach the grounds of the former US embassy in Saigon. Here was the very symbol of American influence in South Vietnam. After more than two decades of American support, billions of dollars in aid, and the loss of countless lives, this is where the US government ended its commitment to South Vietnam. In April of 1975 this virtual fortress was a place of total panic and chaos. 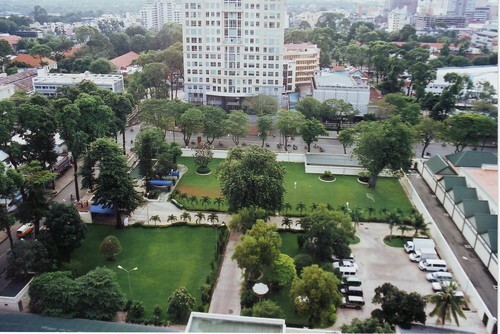 TV cameras captured the scene of American helicopters taking off from the embassy grounds as they evacuated embassy staff, Marine guards, and many Vietnamese refugees. They then flew for the coast, landing on the 7th Fleet’s aircraft carriers in the South China Sea. South Vietnam was abandoned to the advancing communists, who captured the city that same morning. What was left of the embassy was looted. After the war the Vietnamese government took over the old embassy, and Petro-Vietnam, a state owned oil company, moved into the offices. When diplomatic relations were re-established in 1995, the American government managed to get their old embassy property back in the process. Visitors to the rooftop were surprised to find old tattered sandbags leftover from the final evacuation two decades before. 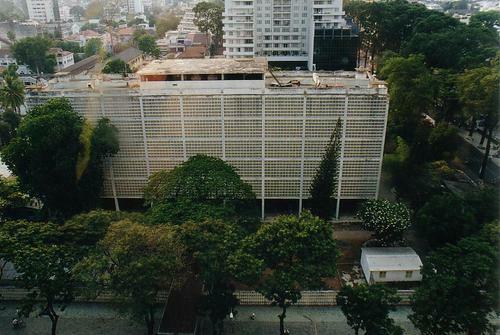 Petro-Vietnam moved out, and the old six story chancery building with the rooftop helipad was torn down. Some of the land next door is now commercial, and today a neighboring high rise towers above the current consulate. In keeping with its new consulate status, there are fewer staff here. Yet, there’s no discounting the importance of the place. Right down the street stands the former Presidential Palace, where the war ended. Next door is the French consulate. Across the street, the British Consulate. These old foreign powers may not call the shots in Southeast Asia anymore, but western consulates still occupy some of the most exclusive real estate in town. Back during the 1975 evacuation, history remembers the nightmare of desperation, as thousands of South Vietnamese mobbed the gates here, hoping to escape the advancing communists. As I approach the embassy this morning, another Vietnamese crowd hoping to leave is present at the entrance. There are hundreds of hopeful emigrants gathered outside the consulate, all desiring a visa to travel to America. The departure of Vietnamese to America is more orderly these days, and visa applications are the consulate's number one activity. Some want to go to America to make money, others to reunite with family that fled the country years before. Like so many in the world who want to become American citizens, they are looking for freedom and opportunity. Some are also university students. Gone are the days when Vietnamese students learned Russian, and traveled to the Soviet Union to study at universities there. The favored study destinations now are Australia and the USA. More than 9,000 Vietnamese students are currently enrolled in American colleges and universities, and that number is growing. Looking to a corner of the consulate’s walls, I see a red stone memorial. At the base, stubs of incense are left in remembrance. This memorial wasn't made for Americans, nor to remember the 1975 evacuation. 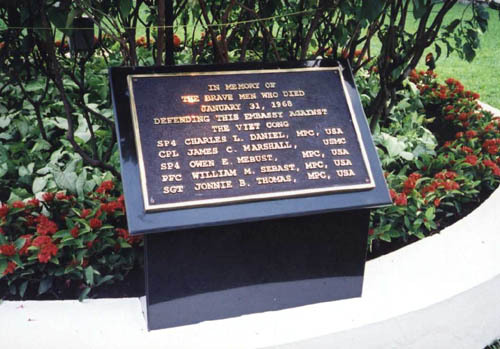 This memorial is for the Viet Cong sapper team of the 1968 Tet offensive, when this embassy became a battleground. At that time, President Johnson was telling Americans that the Vietnam War was going well. The VC attack at this embassy, along with the Tet offensive, proved him wrong. In the early morning hours of January 31, a group of 20 Viet Cong guerillas blew a three foot hole in the exterior wall, and gained entrance to the compound. Once inside, they battled it out with US Military Policemen and Marines. When the fierce firefight ended hours later, five American soldiers were dead. 19 of the VC were killed, with one wounded and captured. Like the Tet Offensive, the embassy attack wasn’t successful, and ended with heavy losses for the communists. Although they had entered the embassy compound, the VC weren’t able to enter the chancery building, but they had proved a point. 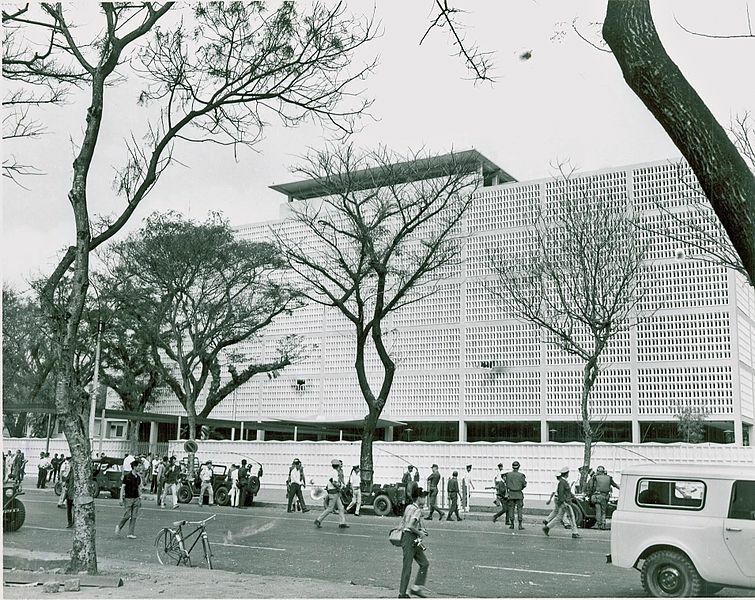 They couldn’t destroy the embassy, but they had turned the site into a battlefield, in the very heart of Saigon. Even in defeat, they had gained a major propaganda victory. The feeling in America changed; it now appeared that the war would drag on indefinitely. After the Tet Offensive, many in America came to believe that that the Vietnam War could not be won, and public opinion turned against the war. Away from public view in a quiet section of the consulate, there is a garden where the old chancery stood. Here lies another small memorial marker, listing the names of the US servicemen who died here during the attack. As far as I know, this is the only memorial marker in existence within Vietnam, that is dedicated to Americans who died during the long war here. Looking at the thick walls and video cameras today, the embassy looks even more secure these days than it did during the war. Like all American embassies worldwide, it has been well fortified to prevent and survive terrorist attacks. Outside the consulate walls, I see an unexpected sign of security: Vietnamese police wearing army style uniforms. They guard and watch over the consulate, carrying Kalashnikov assault rifles, much like the same weapons the Viet Cong guerrillas used to attack this very site years ago. It is a surreal sight, giving the appearance of communists providing protection to the capitalists. How things have changed. I wonder, is their real job protecting the embassy? Or is their job watching the Americans? Or is their job scaring away potential defectors? I enter the walk in entrance, and I’m now in the US consulate in Ho Chi Minh City. I’m surprised to see that the guards at check in are also Vietnamese. “You have mobile phone? Camera? Put them here,” the guard says. I grudgingly hand them over. Like all American embassies, security is tight. No cameras or cell phones allowed inside. Walking past lines of people waiting for visa interviews, I head for American Citizen Services. Upon entry, I find a modern government office. It’s a safe, but sterile atmosphere. A sign of the times in the post-9/11 world, is that US staff in this office are behind bullet proof glass. I’m only here for a simple matter, to install more pages into my packed passport. My turn comes, and I slip the passport under the thick glass to the clerk. Collecting my passport later, one image stands out as I depart: the State Department Seal that hangs on the wall. This is the same large circular logo that hangs in front of the podium at the Secretary of State's press conferences. The difference is the location. The seal reads, “Department of State Ho Chi Minh City”. An official logo of the US government, now bears the name of a man who was once one of America’s worst enemies. Dear Mai, Thank you for the comments that you wrote. I'm glad that you like the blog. If you didn't read it yet, I posted a story on March 4 when I went to Pleiku. It was a good place to visit. I will continue to post stories about my travels in Vietnam every week. I hope it's not too cold for you there in Sweden. Have a good day. Thank you very much for your report. I deeply regret that the embassy is gone and I'll not be able to visit that piece of history on my upcoming trip. Yes the world is a different place since 9-11. I live in Thailand and at the Bangkok Embassy it's not even allowed to bring in a newspaper to read while waiting. Hi, thanks for reading, and thanks for your comment. Yes, it's too bad that that part of history is gone. I'm sure you'll still enjoy your trip, there are still many historical places to see there. Vietnam sure is undergoing lots of changes these days. Great ! Beautifull pictures of an historic building who remains many souvenirs of a tragic period. You web site is fantastic. Thank you for the compliments, I'm glad that you enjoy reading the stories on my website. I'll keep posting photos and stories of my travels there, it is such an interesting place to be sure. Good to hear that the US and Vietnam have recovered from the war and have attempted to build good diplomatic relations again. It will always be a part of both country's histories, but the economic and diplomatic ties are much better than exchanging bullets and blood. Yes, I agree economic and diplomatic ties between the countries are far better. Thanks for checking out my story. At least Reunification Palace still stands as a reminder of the end in 1975. Very enjoyable read, will look for your Pleiku blog as I was there for 2 years during the conflict. Thank you for reading, and for leaving a comment. I hope you liked the Pleiku blog post. I enjoyed visiting there, as well as other parts of the highlands.